We will update this page to promote forthcoming meetings sponsored by CCPQ or organised by, or of interest to, CCPQ members. The contacts for sending in information about meetings are Martin Plummer and Damian Jones. R-Matrix software for atomic molecular and optical physics (R-MADAM 2019) will be held on 24-26 June 2019, at UCL, organized by the CCPQ Software as Infrastructure Flagship project 'R-matrix suites for multielectron attosecond dynamics in atoms and molecules irradiated by arbitrarily polarised light' (R-MADAM). The workshop will involve scientific presentations and four 1/2 day hands-on sessions learning to use some of UK R-matrix based codes. Registration is free and there is no deadline, but places are limited. 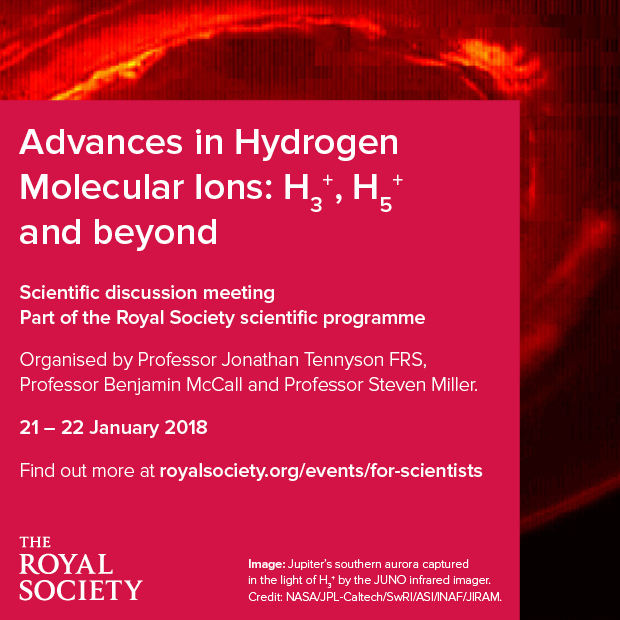 Advances in Hydrogen Molecular Ions: H3+, H5+ and beyond, a scientific discussion meeting organised by Professor Jonathan Tennyson FRS, Professor Benjamin McCall and Professor Steven Miller, will take place at the Royal Society, London, on 21-22 January 2019. This meeting will highlight recent developments in theoretical, laboratory and astronomical studies of the molecular ion H3+ and its hydrogenated cousin H5+. These developments include the first models of H5+, high-resolution studies of H3+ deuterated isotopologues, ultra-cold chemistry studies, new chemical models of the Galactic Centre, and data from the space missions Cassini (Saturn) and JUNO (Jupiter). Attendance is free, please register on the website. The deadline for submitting poster abstracts is 26 November. The UK positron workshop 2018 will take place at Queen's University Belfast on 18-19 December. The UK Positron Workshop is the gathering of the UK community of researchers interested in the fundamental aspects and applications of low-energy positrons, positronium and antihydrogen. Free registration and abstract submission is available until 23 November 2018. Electron Scattering Cross Sections for Plasma Physics and Chemistry with Quantemol-N>: this workshop, sponsored by CCPQ and organised by Quantemol, will take place on 14th September 2018 at University College London, London, UK. The workshop is divided in two parts: a morning session of presentations related to electron-molecule scattering data and an afternoon hands-on session using the Q-N software. For more information please follow the above link to the workshop website. Training Course on Advanced MPI: the CCPQ Software as Infrastructure Flagship project 'R-matrix suites for multielectron attosecond dynamics in atoms and molecules irradiated by arbitrarily polarised light' (R-MADAM) will be hosting an EPCC/PRACE course on Advanced MPI. The course will take place at The Open University in Milton Keynes on 30 and 31 July 2018. For more details and how to register go to: https://events.prace-ri.eu/event/733/. Attosecond and Free Electron Laser Science 2018 (AttoFEL 2018): International Conference at University College London, July 2nd-July 4th 2018, sponsored by CCPQ. Ultra-Short and Intense Laser pulses offer the means to observe, control and probe multi-electron effects during ionization and break-up of strongly-driven atoms and molecules. Moreover, Free Electron Laser facilities is a route to delivering XUV and X-ray pulses with intensities orders of magnitude larger than those provided by conventional synchrotron radiation sources. Ultra-fast and intense X-ray pulses open-up new horizons for probing and controlling the attosecond motion of inner-shell electrons in multi-photon multi-ionization processes. This conference aims to bring together theorists from the FEL and Attosecond-Strong Field Science communities to discuss and present recent advances in theoretical techniques developed to tackle multi-electron effects in ionization of atoms and molecules. Another goal of this meeting is to draw together theorists and experimentalists in order to identify the most interesting challenges that both communities will face in the future. Registration is now open. Plasma Chemistry Workshop 2017: From Chemistry Data to Plasma Design, 15th September 2017, University College London, sponsored by CCPQ, organised by Quantemol. A workshop for professionals in the world of plasma science, with the aim to make the process of moving from chemistry data to plasma chemistry design and plasma modelling as smooth as possible. This will be achieved through talks by developers and users of the Quantemol database (QDB) along with renowned plasma modelling and plasma chemistry experts on the morning of the workshop. We will also be showcasing QDB in the afternoon with demonstrations and a hands-on session for all workshop attendees to ensure users are getting the most out of the database. This 2017 Data 2 Design workshop builds on previous successful events held by Quantemol where academic and industrial researchers have gathered. This is an opportunity for fellow plasma scientists to come together, learn about our plasma chemistry project QDB, network, and explore new opportunities to advance their research. Attendance is free. Windsor 2017: Dynamics of Complex Quantum Systems, 31 July - 4 August 2017, sponsored by CCPQ. This workshop, the 6th in series, is designed to bring together UK theory and experimental groups involved in realising, simulating and modelling the dynamics of a variety of complex quantum systems. The meeting is aimed at discussing both new mathematical and computational methods, as well as new experimental applications/phenomena/physics at a level suitable for postgraduate students in the field. Topics of interest include, but are not limited to: optical lattices, microtraps, coupled-cavity arrays, phase transitions, coherence and entanglement, interferometry and atom optics, superfluidity, non-equilibrium dynamics, spinor and exotic condensates, quantum information applications, experimental perspectives. The extra day for the workshop is dedicated to special sessions on numerical simulation of strongly correlated systems including tensor network methods, environment engineering for quantum computation, cold atoms for quantum simulations and novel architectures for quantum computation and simulation. Brief descriptions of some previous meetings are given below. Please see the archive pages for a more detailed list. A team representing Quantemol, including Professor J Tennyson, presented at International Workshop on Plasmas for energy and Environmental applications (IWPEEA) in Liverpool 21-24 August 2016. XLIC 2016;2nd COST XLIC Working Group 3 Meeting - Control of Chemical Reactivity, QUB, 4-5 April 2016. The topic of interest of the XLIC Working Group 3 (WG3) is to control the reactivity of highly excited and/or ionized molecules through pump-probe techniques and High Harmonic spectroscopy, i.e., to control electron transfer, isomerization and dissociation with attosecond temporal and sub-Angstrom spatial resolution. Quantemol Workshop 2015, Linking Simulation with Experiment, UCL, 11 September 2015, sponsored by CCPQ. Windsor 2015: Dynamics of Complex Quantum Systems, 3-6 August 2015, sponsored by CCPQ.This workshop, the 5th in series, is designed to bring together UK theory and experimental groups involved in realising, simulating and modelling the dynamics of a variety of complex quantum systems. The meeting is aimed at discussing both new mathematical and computational methods, as well as new experimental applications/phenomena/physics at a level suitable for postgraduate students in the field.Topics of interest include, but are not limited to: optical lattices, microtraps, coupled-cavity arrays, phase transitions, chaos, coherence and entanglement, interferometry and atom optics, superfluidity, non-equilibrium dynamics, spinor and exotic condensates, quantum information applications, experimental perspectives. The AttoFEL 2014 conference, Free Electron Lasers and Attosecond Light Sources: portals to ultrafast dynamics in AMO systems, UCL, 30 June - 2 July 2014, sponsored by CCPQ.